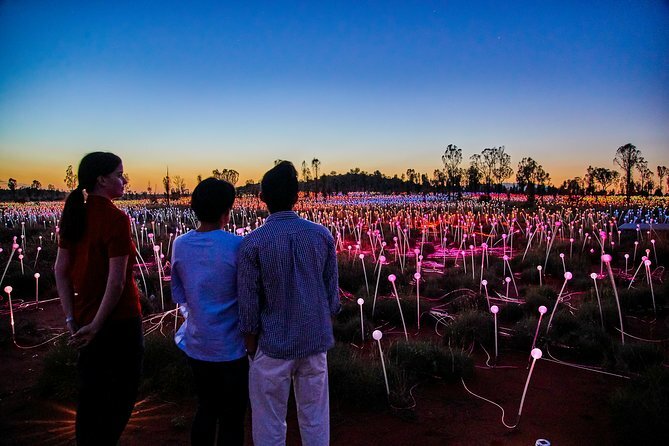 Internationally acclaimed artist Bruce Munro’s Field of Light, inspired by a trip to Uluru 24-years ago, has been installed in a remote desert area within sight of majestic Uluru. It is the largest Field of Light installation to date, with Munro and his team installing more than 50,000 slender stems crowned with radiant frosted-glass spheres. Rise early to travel the short distance to a desert location overlooking Uluru. Your Driver Guide will provide insights and background to the art installation. Under the cover of darkness you’re invited to wander through the pathways that encompass the 50,000 spheres of light in the desert, before making your way up the hill to the Dune Top viewing area. Watch the amazing transformation of colors and life as the desert awakens, while enjoying tea, coffee or hot chocolate. Then as the first rays of sunlight creep across the desert sky, gaze in awe as the sun rises in the distance behind Uluru, flooding the landscape, including Kata Tjuta behind you, with light. You’ll have an incredible view through stunning desert landscape as the sun rises over the Red Centre. As the natural light brightens the landscape, the Field of Light will dim for the day. Capture some amazing photos from this unique raised location, which allows you to view both Uluru and Kata Tjuta in all their natural glory. Well organized. Chose the morning because it was less expensive to do the sunrise tour. The evening tours are run by the Ayers Rock resort. Bring a fly net. Did not know what to expect but the field of lights was spectacular. I would recommend this to everyone, it was beautiful. One of my highlights of our red centre trip! What an amazing experience. Catch it while you can. Brilliant experience with fantastic guides. We did the basic walk and felt that was good enough. Unique experience well organised, and well worth the trip! The field of light meets the stars and is spectacular. To walk around in the dark and quiet and watch the lights change colour was brilliant. You have to do this at least once in your lifetime. It's a great bargin for the spectacular sight you'll see only in this spot, at this certain time of day.